Multiple Sclerosis (MS) is an inflammatory demyelinating disease of the central nervous system and exercise has been controversial issue in the past. Typically, it was recommend to MS patients not to exercise and to save that energy to perform activities of daily living (ADLs). Today, however, it is known that exercise can be a safe and efficient way to achieve physical improvements and has the potential to improve quality of life for MS patients. Fatigue is one of the most common symptoms reported in MS and can significantly reduce quality of life. Fatigue can be defined as a lack of physical and/or mental energy, uncontrolled apathy, feeling exhausted that is perceived by the individual or caregiver to interfere with usual desired activities. Fatigue can be measured with many different scales, but two of the most frequently used scales are the Fatigue Severity Scale (FSS) and the Modified Fatigue Impact Scale (MFIS). The FSS is composed of 9 items which the patient responds on a 7 point scale, and the MFIS contains 21 items. Fatigue impacts all aspects of the MS patient’s life and can interfere with exercise ability. It has been reported that patients with MS typically have a lower daily activity level than matched healthy individuals and many of the symptoms associated with inactivity have been seen in this patient population. Inactivity related health issues such as an increased incidence of osteoporosis, depression, fatigue, and death from cardiovascular diseases have been seen in MS patients. Individuals with MS also demonstrate reduced aerobic capacity (VO2 max), elevated resting heart rate and diastolic blood pressure, and reduced maximal muscle strength in both isokinetic and isometric muscle contractions when compared to healthy individuals. The American College of Sports Medicine recommends at least 5 days per week of moderate intensity (40-60% VO2 max) aerobic activities, weight-bearing exercise, and flexibility exercise for healthy individuals. However, this frequency and intensity may be too high due to the fatigue experienced in MS and therefore, general exercise recommendations have been developed for individuals with MS. These recommendations were compiled from comprehensive reviews by Dalgas et al. and Petajan and White. 1. Bicycle ergometry, arm-leg ergometry, arm ergometry, aquatic exercise, and treadmill walking have all shown to have favorable improvements in MS patients. Activities such as running, road cycling, and rowing should be employed by well-functioning MS patients only. 2. Training frequency of 2-3 sessions per week is recommended. 3. Training intensity should initially be 50-70% of VO2 max corresponding to 60-80% of maximum heart rate. 4. Exercise duration should initially be 10-40 minutes depending on the level of disability of the MS patient. A 5 minute warm up and cool down period should be incorporated. 5. During the first 2-6 months of training, progression should be obtained by increasing the training volume by extending the session or by adding an extra training day. After this initial period of exercise, it should be tested to see if a higher intensity can be tolerated. 1. In the initial phases of training, the use of machines is preferred over free weights. 2. Home based training with use of elastic bands and body weight as load can be an alternative way of training for individuals unable to leave home. 3. Intensities in the range of 8-15 repetition maximum should be recommended. Intensities of 15 repetition maximum should be used in the initial training phases and then progressed to 8-10 repetition maximum. 4. Initially the number of sets of each exercise should be 1-3. That can progress to 3-4 sets of every exercise after several months of training. 5. Rest periods between sets and exercises of 2-4 minutes are recommended. 6. A training frequency of 2-3 days per week is usually tolerable and adequate for improvements in MS patients. 7. A whole body program consisting of 4-8 exercises should be performed each session. However, lower extremity exercises should take higher priority due to the extent of strength deficit in the lower extremities is much greater than the strength deficit in the upper extremities. 8. Exercise should be planned so that large muscle groups are performed before smaller muscle groups. Also, multi-joint exercises should be performed before single-joint exercises. Endurance and resistance training in MS target different areas in an individual’s physiological profile. Endurance training shows improvements in the cardiorespiratory and neuromuscular systems, while resistance training shows increases in muscle mass and improves neural activation. For an overall physiological benefit to occur from exercise, it may be beneficial to combine both endurance and resistance training. Recommendations for combining endurance and resistance training have been developed and are in the chart below. 1. Combine training based on equal portions of endurance and resistance on alternating days of the week. 2. 2 days of endurance training and 2 days of resistance training is the maximum initial intensity recommended. 3. The 2 bouts of endurance training and 2 bouts of resistance training should be separated by 24-48 hours for optimal recovery. 4. Follow earlier endurance and resistance training guidelines when designing a combined program. In a study by Stroud and Minahan, patients with MS were randomized into either a control group (non-exerciser) or an intervention group (exerciser). Each patient was assessed on their physical activity level (International Physical Activity Questionnaire), depression (Becks Depression Inventory), fatigue (Modified Fatigue Impact Scale), and quality of life (Short Form-36). 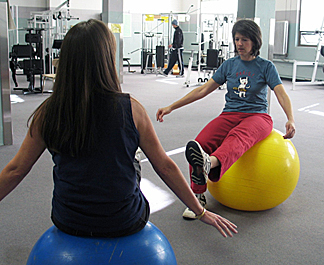 The exercise group participated in at least 2 sessions per week for 30 minutes and the non-exercise group did not participate in any regular exercise. The exercise group had favorable improvements in fatigue, depression, and quality of life compared to the non-exercise group. In a study by Dalgas et al. patients with MS were randomized into either a control group or an exercise group to determine benefits of resistance exercise. Prior to any intervention, all patients were assessed on fatigue (Fatigue Severity Scale, FSS), mood (Major Depression Inventory, MDI), and quality of life (physical and mental component scores PCS and MCS of SF-36). The exercise group was then given a 12 week progressive resistance training intervention consisting of resistance training of the lower extremities performed twice weekly. After a 5 minute warm up on a stationary bike, MS participants performed leg press, knee extension, hip flexion, hamstring curl, and hip extension. All exercises were progressively increased in weight, number of repetitions, and number of sets during the 12- week intervention period. Scores on the fatigue, mood, and quality of life scales significantly improved and remained for the 12 week follow-up suggesting the beneficial impact of a progressive resistance program for MS patients. The incidence of MS exacerbations is not increased by physical activity, however; should an exacerbation occur, marked by new signs and symptoms, the exercise program should be modified or temporarily discontinued accordingly. If possible, exercise should be continued during exacerbations in order to minimize deconditioning and prevent disability. Patients with MS are more susceptible to temperature-induced temporary clinical worsening, as the increase in temperature will slow and block nerve impulse conduction in the demyelinated fibers. Pre-exercise cooling activities have been shown to enhance performance and reduce feelings of fatigue. Now that a holistic overview of exercise in people with Multiple Sclerosis has been described, the following section will describe the effects of exercise on MS at a systemic level. Cognitive impairments have been reported in 45-65% of patients with MS with consequences including disease-related unemployment, reductions in activities of daily living, and compromised social relationships. Cardiorespiratory fitness has demonstrated a protective effect against age-related cognitive decline in older adults, and thus the researchers Prakash et. al. conducted a study to examine whether cardiorespiratory fitness can similarly protect against neurodegenerative decline in patients with MS. Prakash et. al. reported a previous study in which participants in an aerobic conditioning group demonstrated changes in frontal regions of the cortex associated with higher order attentional control and memory processes. What is promising is that these are the same processes affected with cognitive decline in MS.
Studies have demonstrated an increase in fMRI cortical activity in patients with MS compared to normal controls, which is suggestive of neuroplastic changes in response to increased demands to perform a task. In other words, since demyelinated axons have impaired responses to demands, such as exercise, other areas of the brain are recruited to compensate for this loss. More specifically, in studies comparing individuals with MS and healthy controls, there is activation of the left frontal and parietal lobes during task performance in the healthy controls. Patients with MS similarly activate these regions in the left hemisphere in addition to activating right frontal and parietal regions to optimize task performance. These findings provide support for the notion that cardiorespiratory fitness enhances neuroplasticity to improve cognition in individuals with MS.
Based on the above findings, Prakash and colleagues designed a study to examine the relationship between cardiorespiratory fitness, brain function, and cognition in 24 patients with relapsing-remitting MS (RRMS). An MRI system scanned the patients’ brains while they performed the Paced Visual Serial Addition Test (PVSAT), which is the visual version of the Paced Auditory Serial Addition Test (PASAT) and has been extensively studies in MS populations. The PVSAT is a task in which patients were presented with 4 blocks with 8 digits in each block. The patients had to add digits in the blocks and press a button with their left index finger if the sum of the digits was < or = to 10 and press a button with their right index finger if the sum of the digits was > 10. Additionally, patients performed a VO2peak cycle ergometer test by performing a cycle test at increasing 15 W min-1 power output incrementally until volitional fatigue. Patients were then categorized as either ‘high-fit’ or ‘low-fit’ based on the median split of their VO2peak. The results indicate reaction time on the PVSAT were significantly correlated with VO2peak scores of participants (pr= -0.51, p<0.02), and higher levels of fitness were associated with faster responding time on the PVSAT. Also, there were correlations between two brain regions and fitness. Cardiorespiratory fitness was positively correlated with right inferior frontal gyrus (IFG)/ middle frontal gyrus (MFG) (BA 9; pr= 0.46, p<0.03), and negatively correlated with anterior cruciate cortex (ACC) (BA 32; pr= -0.44, p<0.04). Following a one-way ANOVA investigating the difference between high-fit and low-fit individuals, “high-fit participants showed greater percent signal change than low-fit participants in the right IFG/MFG, whereas the low-fit participants recruited more of the ACC.” Other studies such as Staffen et. al, Audoin et. al, and Chiaravalloti et al support activation of right frontal and parietal regions, such as IFG/MFG, in MS as a contralateral hemisphere compensatory mechanism to meet the demands of a challenging task. Conversely, the increase in ACC activity corresponds to an increase in conflict and requires an additional effort to resolve conflict. In synthesizing these results, increased cardiorespiratory fitness led to increased activation of the contralateral hemisphere in high-fit individuals and an increase in ACC activation in low-fit individuals. One can presume high-fit individuals are better adept at compensating for MS neurodegenerative changes, specifically when it comes to cognitive tasks, by recruiting the contralateral side. This is compared to low-fit individuals who recruit less of the contralateral cerebrum and instead may require increased effort to resolve a task. This information can be used clinically to encourage increased cardiorespiratory fitness in patients with MS, since the implications of this study indicate cardiorespiratory fitness may be a way of activating brain regions that degenerate with cognitive decline. MS patients and normal controls. MS patients show greater activation in pre- and post-central gyri, the anterior cingulated gyrus, the superior temporal gyrus and the insula compared to healthy controls. White and colleagues designed a study to examine regional brain activation fMRI in patients with MS and compared this to normal controls during hand flexion and extension tasks before and after a fatiguing hand-grip exercise. Testing both pre- and post-fatiguing exercise allowed the researchers to observe whether both groups increased their activation of the key brain regions after enhancing fatigue, or whether MS patients are unable to increase activation after a certain plateau as suggested by these researchers’ previous TMS studies. In the experimental design, participants were asked to repeatedly flex and extend the four fingers on their right (dominant) hand paced by an auditory cue for 30 seconds on and then 30 seconds rest in a block design ABAB sequence. This was repeated before and after a fatigue-grip protocol. The fatigue-grip protocol consisted of maximal effort hand-grip exercise sustained for 3 minutes. fMRI was used to acquire imaging of the brain during pre- and post-fatigue motor activation for both groups of patients. The results demonstrated patients with MS had significantly lower grip force through the first 100 sec of fatigue-grip protocol, and they had a more rapid decline compared to controls. The study reports, “[The] average time to ½ peak force was 32 s for MS patients compared to 69 s for controls (P < 0.05).” fMRI activation before fatigue protocol demonstrated significantly higher activation (P < 0.05) in the MS patients in contralateral (left) precentral gyrus, ipsilateral cerebellum, ipsilateral insula, and contralateral and ipsilateral cingulated gyri (all areas involved in motor function) compared to the controls. There was a similar trend in contralateral insula. After the fatigue protocol, there was no difference between the MS and controls, because the MS patients demonstrated no reliable increase in activation and the controls demonstrated a significant increase in activation in these areas(P < 0.05). In synthesizing the results, there is an increased fMRI activation in MS patients prior to fatigue and no difference in activation after the fatigue protocol (because controls increased activation, and MS patients’ activation remained about the same), which can be attributed to the following rationale. First, the increased activation in controls post-fatigue protocol supports the idea that “controls compensate for fatigue by activating more neurons,” which has been demonstrated on fMRI in previous studies. The heightened activation in MS patients on the hand motor task before the fatigue protocol “may be due to the patients’ perception of the task as being complex or novel and requiring greater voluntary effort, as a proportional relationship exists between cortical signals and voluntary effort.” The lack of increase in activation in MS patients post-fatigue can be attributed to saturation, or, the brain structures have already optimized the amount of activation possible in those regions. This information can be used clinically to understand the relationship with MS patients and fatigue. A ‘normal’ task might fatigue a patient with MS more quickly, because they may be increasing the activation of other areas of the brain as a compensatory mechanism. 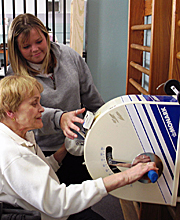 Considerations include energy-conservation techniques and organizational skills/ADL scheduling to assist the patient in coping with symptoms of fatigue. Strength impairments seen in MS patients may be a direct result of the disease process of demyelination and axonal degeneration in the central nervous system or a consequence of the reduced physical activity level seen in MS patients. Because several studies have shown significant improvements in almost all physiological measures in MS patients after exercise, it seems likely that a substantial part of the impairments is a result of inactivity rather than non-reversible CNS injury. A number of studies have indicated muscular changes through a variety of mechanisms. At the systemic level, Formica et al. demonstrated a small but significant lowering of fat free mass in female MS patients as compared to healthy controls. At the muscular level, Kent-Braun et al. showed a significant reduction in the fat free cross sectional area of the anterior compartment of the lower leg. Histochemical analyses of biopsies from the anterior tibialis have shown a reduction of the average muscle fiber area in MS patients compared to healthy subjects. Garner et al. found smaller Type 1 and Type IIa muscle fiber areas in MS patients as compared to healthy controls. Several studies have found muscle fiber composition to be different in MS patients compared to healthy controls and reported a shift in fiber type composition from Type 1 fibers toward Type IIa and IIax fibers. This shift in composition resembles the pattern seen in healthy subjects exposed to immobilization. Patients with MS have shown a reduced ability to fully activate motor units in the thigh and lower leg muscles during maximal voluntary contractions when compared to healthy controls. Resistance training seems to be well tolerated by MS patients and has shown the ability to reverse some of the above changes. A majority of reports indicate an improvement in muscle strength after resistance training. White et al. reported a significant increase in maximal isometric knee extensor strength after resistance training. Kasser et al. evaluated maximal dynamic knee extensor strength at both slow and fast velocities and found significant improvements in strength at both velocities. Another study by Taylor et al. reported significant increases of strength in one repetition maximum strengths of the arm and leg press exercise. Moderate intensity resistance training seems to be well tolerated by patients with MS and leads to significant improvements in muscle strength. Several studies have evaluated the effects of endurance training and its effects on aerobic capacity of individuals with MS. Petajan et al. and Ponichtera-Mulcare et al. found significant improvements in VO2-max after arm-leg ergometry, training at moderate intensity. A study by Mostert and Kesselring demonstrated a rightward placement of aerobic threshold which indicated an improvement in aerobic capacity when working at submaximal intensities. Several studies have tested endurance training as an intervention against fatigue and functional capacity and activities of daily living. Endurance training with low to moderate intensity is well tolerated among MS patients. Furthermore, this training modality has a possible beneficial effect on both the physiological and psychological profile of MS patients. Central motor impairment can be a primary consequence of MS and significant peripheral changes may arise from chronically altered central motor function. Muscle weakness in MS is of central origin and results from both decreased motor unit discharge rates and incomplete motor unit recruitment. Muscle strength is also related to muscle fat free cross-sectional area and this peripheral relationship can help explain any weakness in MS. Altered peripheral muscle function in MS includes the slowing of muscle contractile properties, decreased muscle oxidative capacity, possibly impaired excitation–contraction coupling, and an altered muscle metabolic response to exercise. These changes appear to be secondary to central nervous system impairment and may be related to disuse. In a study by Ng et al.,. central motor impairments and altered peripheral muscle properties were investigated in the same subjects. Central motor function was measured by the number of foot-taps performed in 10 s, the rate of voluntary force development, and the central activation ratio. Peripheral muscle function was also measured. Muscle strength and gross cross-sectional area were measured using magnetic resonance imaging.. The following results were obtained from the study: with regard to the central motor functions, the subjects with MS were able to perform only about half the number of foot-taps in 10s compared to control subjects; the maximal rate of force development was also found to be slower for the group with MS than in controls; the MS group also had a lower central activation ratio which indicates an inability to maximally activate the dorsiflexor muscles during a single maximal voluntary isometric contraction. All central motor function measures indicated central impairment in the MS group. Altered peripheral function, thought to be caused by impairment of central motor drive, is proposed to be the primary role in the weakness of MS. The MS group was found to be significantly weaker than the control group though they demonstrated similar dorsiflexor muscle cross sectional area to the controls, indicating that cross sectional area does not directly correlate with strength. According to a study by Harvey et al., a relationship exists between the force of a contraction and muscle motor unit recruitment in normal subjects as measured by surface EMG. EMG may be more sensitive to measurement of muscle recruitment due to its relationship with the number of motor units being recruited in a muscle contraction. Muscle weakness in MS is not likely due to loss of function but rather the impairment of the conduction of nerve impulses within the central nervous system leading to the inability to recruit all available muscle fibers. It was found that conventional strengthening exercises such as weighted leg extensions lead to no deterioration in people with MS and may in fact result in some improvements. In these subjects, a combination of gentle weighted exercise and mobility exercises may improve weight-bearing and mobility. Physiological characteristics of the muscle showed improvements with weighted leg extensions and mobility exercises as determined by surface EMG and force measurements. EMG recordings were used to find an increase in maximum voluntary contraction and to find an increase in recruitment of fibers. These results indicate that neuromuscular capacity can be improved even when there is underlying neurological damage. Kent-Braun et al. investigated the role of skeletal muscle oxidative metabolism in muscle fatigue during voluntary exercise in people with MS. In one study, subjects performed intermittent, progressive, isometric contractions of the ankle dorsiflexors while the maximum voluntary force, inorganic phosphates, phosphocreatine, and pH were measured. According to the results, the maximum voluntary force fell sooner in those with MS but the final decrease was similar in both groups. Meanwhile, the inorganic phosphates and phosphocreatine which increased in controls, remained approximately the same in those with MS, and pH, which decreased in controls, remained stable in the MS group suggesting a failure of muscle activation. These measures indicated some central activation failure. The other study used phosphorus magnetic resonance spectroscopy to measure the rate of intramuscular phosphocreatine in a group with MS and a control group. Patients with MS underwent intermittent isometric tetanic contractions of the ankle dorsiflexors elicited by stimulation of the peroneal nerve while healthy control subjects performed voluntary isometric exercises. No differences were found in the phosphocreatine or pH during exercise. After exercise, the half-time of phosphocreatine recovery was significantly longer in those with MS. These data provide evidence of slowed phosphocreatine resynthesis following exercise, indicating impaired oxidative capacity in the skeletal muscle of these individuals. This suggests that intramuscular changes consistent with deconditioning may be important in the altered muscle function of persons with MS.
Up to 80% of people with MS have reported temporary worsening of symptoms with increased core temperature resulting from heat exposure, increased metabolism as with exercise, or from a combination of these which results in exercise heat stress. Both physical and cognitive functions, such as memory, processing, and multitasking, can be impaired by heat exposure. Fatigue brought on by heat is common in people with MS, occurring in up to 70% of individuals. This fatigue is generally accepted as centrally driven, as discussed above, and is characterized by inability of the central drive to uphold spinal motoneuron activity. In the past, people with MS were advised to minimize exposure to hot environments and exercise, however the fact that lack of exercise leads to deconditioning, impaired functional capabilities, and increased risk of injury has forced researchers and clinicians to reconsider this notion. Recent studies have shown that exercise is indeed beneficial in MS patients despite concerns about the effects of increased core temperature. In response to stress, a set of cells called heat shock proteins (HSPs) are activated. HSPs are chaperone proteins, which have various roles in providing protection and aiding the function of other proteins. One of their functions is to provide protection and aid in the repair of neural cells in response to damage caused by neurodegenerative diseases, as in MS. Both HSP90 and HSP70 protein families are thought to be vital in the heat shock response in defending against various stressors, including heat stress, hypoxia, inflammation, injury, and reactive oxygen species (ROS), along with suppression of inflammatory gene expression. A protein called HSP90-beta, which is expressed on the surface of oligodendrocyte precursor cells (OPCs), has been shown to be present in the cerebrospinal fluid (CSF) of patients with MS. Interestingly, another study by Cid et al found the presence of antibodies against HSP90-beta in the CSF of patients with relapsing-remitting MS in remission, which were thought to have caused a decrease in oligodendrocytes. The authors conclude that prolonged exposure to these anti-HSP90-beta antibodies could lead to reduction in OPC population. They also point out that these detrimental antibodies were found to remain in the CSF during remission and may play a role in demyelination. Whether the antibodies against HSP-beta are present with exercise was not discussed in this study, however as will be discussed below, HSPs in general are known to increase with exercise. Exercise is considered a stressor to the body and activates the heat shock response in normal individuals. HSP72, a member of the HSP70 family, is released in response to many stressors, including exercise. This protein is released in the brain during exercise extracellularly, and is then captured by antigen presenting cells (APCs) and its fragments are presented on the surface of MHC class I molecules. This sequence then activates an immune response to stimulate innate immunity and defend against pathogens. It has been shown that HSP72 may have little effect on innate immunity if it does not come into contact with certain cells and it has been shown that this protein is capable of activating cytotoxic T lymphocytes. This is possible through the recognition of HSP72 by MHC class I molecules and if stimulated by APCs, a potent immune response can occur. The effect of this response in MS is not well understood, however the fact that ROS production is increased and cytotoxic T cells are already activated in this disease calls into question exercises’ effect on these cellular processes in MS. The nervous system uses saltatory conduction to generate and propagate action potentials. This involves the progressive opening of voltage-gated Na+ channels to generate new action potentials down the axon, with the action potential “jumping” over nodes of Ranvier, or demyelinated areas of the axon. Myelin acts to increase the speed of action potential propagation and ensure the potential can reach the desired distance. In people with MS, increases in just 0.5 deg Celsius in temperature have been shown to cause signal slowing and even complete blockage of nerve impulse conduction. This is referred to as Uhthoff’s phenomenon and has been shown to occur even in people with mild cases of MS, however the severity of this increases with the severity of the disease. Previously it was thought that exercise would be detrimental to people with MS due to this phenomenon of symptom increase with temperature rise, however more recent studies demonstrate the benefits of exercise outweigh the negative effects. The mechanisms underlying Uthoff’s phenomenon are not well understood but are thought to be a combination of the physiological and structural changes in the CNS axons with MS.
Rossi et al. identify significant alteration of the endocannabinoid system (ECS) as a major factor in the development of experimental autoimmune encephalomyelitis (EAE) in animal models. The cannabinoid CB1 receptors in the central nervous system (CNS) control GABA synapses in the striatum and loss of the sensitivity of these receptors has been associated with increased severity of EAE in animals. Impairments in these synapses precedes pathology of the dendrites and neuron loss in many neural diseases. Rossi et al. demonstrated the neuroprotective effects of exercise in EAE mice by showing increased preservation of the CB1 receptors in voluntary exercising mice compared to non-exercising mice. The authors identify a link between maintenance of CB1 receptor sensitivity and spine density in the exercising mice. Although these results were produced in an animal model, EAE is the primary model used to study MS and has furthered the understanding of the pathophysiology of MS. Certainly the link drawn here between exercise and neurprotection is promising and provides support for use of exercise as therapeutic intervention in patients with MS.
As described previously in the multiple sclerosis cellular biology section, mitochondrial function is altered in this disease and ultimately results in increased production of reactive oxygen species (ROS) in neural tissue. It is well understood that exercise increases metabolism and thus increases mitochondrial activity, ultimately leading to greater ROS production. Therefore, the effect of exercise on the mitochondria in individuals with MS should be considered. Axons require incredible amounts of energy to conduct signals properly. ATPase is seen to be in great numbers along the myelinated portions of axons, facilitating rapid exchange of sodium and potassium; a process necessary for active transport and depolarization of the axon. Saltatory conduction is mediated by these active transport channels, which are clustered at the nodes of Ranvier to allow fast and efficient signal propagation. During acute attacks of MS, demyelination occurs rapidly along with inflammation. Chronic lesions present continuous demyelination, although the number of axons undergoing demyelination at a certain point in time is far fewer than in an active lesion. Recent studies have shown that in chronic inactive lesions, there is increased activity and density of complex IV, also identifying decreases in complexes I and III in white matter lesions. These results may indicate an adaptive response of the mitochondria to the demyelination. Although this adaptation allows the mitochondria to continue functioning in MS, these alterations ultimately impair the function and structure of the axons and possibly contribute to the disease progression. With chronic inflammation causing complex inhibition by nitric oxide and peroxynitrate and ROS production, the mitochondria in MS are seen to be highly vulnerable. Also lending the mitochondria in MS to increased vulnerability is the fact that the brain has lower antioxidant enzyme activity than other tissues and has high levels of polyunsaturated fatty acids, which are very susceptible to peroxidation. It is well understood that mitochondrial function increases in response to heightened activity level to supply the energy necessary to complete the task. Mitochondria are quite adaptive and change morphology in response to various conditions, including exercise. The mitochondria respond to exercise by not only increasing ATP production via OXPHOS, but also by augmenting gene expression of enzymes and proteins, upregulating mitochondrial biogenesis, and initiate morphologic changes through fission and fusion. Mitochondria become more elongated and interconnected with increased fusion or decreased fission, whereas increased fission or decreased fusion can result in smaller, more fragmented mitochondria. Fusion is seen to be controlled by Mitofusion 1 and 2 (Mfn1/2), while fission is controlled by Fis1 and dynamin-related protein 1 (Drp1). Mitochondrial morphology occurs in response to various stimuli, whether normal or pathologic, and occurs in all mitochondria. During acute exercise, the mitochondria network reorganizes when switching from anaerobic glycolosis to mitochondrial oxidation. In the absence of glucose, energy production is dependent on OXPHOS. Stimulation of OXPHOS causes mitochondria to become thinner, elongated, and more interconnected. The mitochondrial response to acute exercise depends on the specific type, duration, and intensity of the activity. Heavy exercise is associated with increased ROS production as well as mitochondrial fragmentation and oxidative phosphorylation (OXPHOS). A study by Ding et al. examined the effect of treadmill running in skeletal muscle mitochondria of rats. During acute prolonged exercise, the expression of mRNA of Mfn1 and Mfn2 were both progressively reduced, whereas Fis1 expression increased over time. Their results suggest that mitochondrial fission and fusion are quickly altered in response to changing skeletal muscle energy demand during exercise. As exercise intensity and duration increase, so does ROS production. Ding et al conclude that in order for mitochondria to maintain function during exercise and avoid oxidative damage, it must undergo changes to either increase the inner membrane density or the number of mitochondria via biogenesis or undergo alterations via fission and fusion. There are still many unanswered questions regarding mitochondrial response to exercise and how this is altered in diseases like MS. Regardless of the specific changes, it is apparent that mitochondria undergo significant changes in response to exercise and the effect on already stressed mitochondria, such as in MS, must be considered when developing an exercise plan. Nerve growth factor (NGF) and brain-derived neurotrophic factor (BDNF) are two specific forms of a group of proteins called neurotrophic factors, which are produced within the CNS by neurons, glial cells, microglial cells/macrophages, and lymphocytes. These proteins play a role in impeding neural cell death and favor neural generation and remyelination. Within the CNS, NGF and BDNF bind with high affinity to specific tyrosine kinase receptors in order to increase signaling cascades that promote cell survival. These neurotrophic factors also bind with low affinity to p75 receptors, which have shown to regulate cell death. Prior research has shown that neurotrophic factor levels are increased within cerebrospinal fluid and at lesion sites of MS patients. An additional study by Sarichielli et al. demonstrated BDNF production was significantly increased during relapse and recovery phases compared to the stable phase of the disease. They also discovered decreased levels of BDNF in secondary progressive patients, indicating a possible link between neurotrophic factors and the severity of MS progression and axon damage. Exercise has shown to directly effect neurotrophic concentration. In a study of acute exercise, defined as a 30 minutes of aerobic activity on a cycle ergometer at 60% of VO2max, serum levels of neurotrophic were measured in MS patients and compared to age-matched healthy volunteers. In patients with MS pre-exercise NGF serum levels were significantly increased compared to volunteers, however there was no difference in serum BDNF serum levels between groups. Following moderate exercise, serum BDNF levels significantly increased in both the MS group and the control. NGF serum levels were also increased in both groups, however the increase failed to reach statistical significance. Additional research has studied the effect of aerobic training on neurotrophic serum levels in MS patients. Patients in this study completed twice weekly cycling ergometry training for 8 weeks at 60% of VO2max for 30 minutes. Following the training program, BDNF serum levels increased compared to a control group of MS patients at rest and following exercise. However, increases failed to release statistical significance. Additionally, NGF serum levels decreased at rest and following exercise as did control groups, but the decreases did not reach statistical significance. A 10-week strength-training program has shown not to increase serum BDNF levels following acute training or following the training period in healthy, untrained individuals. Animal studies have also been used to investigate the effect exercise has on neurotrophic factors. Exercise training has shown to increase BDNF and NGF, while decreasing reactive oxygen specifies in rat brains. Healthy rats in this study completed 5 weekly 2-hour training sessions of swimming aerobic training for 8 weeks. Following an 8-week detraining period BDNF and NGF levels significantly decreased in rat brains, suggesting potentially adverse effects to a sedentary lifestyle. Research by Berchtold et al. has shown that brain BDNF levels in healthy rats significantly increases following daily voluntary exercise and intermittent exercise. Additionally, the BDNF levels remained elevated for several days post-exercise. While neurotrophic factors have shown to cross the blood brain barrier in experimental models, this activity has yet to be replicated in human subjects. Due to this finding, it is premature to associate serum neurotrophic levels with the potential benefits of neurotrophic factors within the CNS. Further research is necessary to better understand the significance of elevated serum neurotrophic factors in patients with MS.
IGF-1 is a pleiotropic peptide that has been shown to promote oligodendrocyte maturation and survival, as well as myelin regeneration in the CNS. This peptide also increases mRNA synthesis for myelin basic protein and proteolipid protein at lesion sites in animal models. Additionally, IGF-1 has shown to regulate T-cells and decreases T-cell crossing through the blood brain barrier into the CNS. Carro et al. concluded that a one-hour treadmill training session at a rate of 17 m/minute induced IGF-1 synthesis in the liver and IGF-1 uptake in brain structures in healthy rats. An additional study by Carro et al. administered subcutaneous IGF-1 blocking antibody to healthy rats completing treadmill training 60 minutes per day for 5 weeks at a rate of 17 m/min. Following the training program the neuroprotective effects of exercise diminished significantly, implying exercise supports brain health and IGF-1 plays an important role in the neuroprotective process. A 10-week strength-training program has shown not to increase serum IGF-1 levels following acute training or following the training period in untrained, human subjects. To review, Cytokines are proteins that can be secreted by a variety of cells and are greatly important in the immune inflammatory response. Research suggests that MS results from a dysregulation of the secretion of cytokines that promote the pro-inflammatory response versus cytokines that promote the anti-inflammatory response. Exercise has been shown to have an effect on the immune system by influencing local and systemic cytokine production for a variety of chronic and inflammatory diseases by enhancing anti-inflammatory effects. Therefore it is postulated that in MS, exercise may have a therapeutic benefit by enhancing anti-inflammatory cytokine production and inhibiting pro-inflammatory cytokine responses. This section outlines research on the effects of exercise on several key cytokines related to the disease process of MS. The studies outlined in the following charts included participants with relapsing-remitting MS in the remitting phase and not receiving steroid therapy. Heesen et al. 2003  Aerobic training: 30 minutes of cycling at 75% of maximum watts determined by exercise testing. Twice weekly for 8 weeks. NA Not significantly induced in controls or MS patients after 8 weeks. Data suggests no significant increase in this Th2 anti-inflammatory cytokine with exercise. White et al. 2006  Resistance training: Lower extremity strength exercise, twice weekly for 8 weeks up to 10-15 repetitions at 70% maximum voluntary contraction (MVC). Significantly reduced in resting blood concentrations in patients with MS. Significantly reduced in resting blood concentrations in patients with MS. Resistance training may have an impact on cytokine concentrations; however, it caused reductions in anti-inflammatory cytokines. Golzari et al. 2010  Combined exercise training: 10 minutes stretching, 20 minutes aerobic, 20 minutes resistance training for 24 sessions over 8 weeks. Trend towards an increase in MS patients but not significant. NA While the increase in IL-4 was not significant, data suggests combined training may have beneficial anti-inflammatory effects. See results in next table. Heesen et al. 2003  Aerobic Training Not significantly induced in patients with MS or controls Strongly induced directly after exercise in controls and MS patients. Data suggests a pattern shift toward Th1 cytokines with exercise. White et al. 2006  Resistance Training Trend towards decreased TNF-alpha concentration in blood, but not significant in MS patients Significantly reduced concentration in blood in MS patients Data suggests a decrease in Th1 cytokines. However, the results are variable and inconsistent with decreases in anti-inflammatory cytokines as well. Golzari et al. 2010  Combined Training NA Significantly decreased in peripheral blood and plasma after 8 weeks of combined training. Data suggests that combined exercise affected the Th1 cytokine responses more efficiently than Th2 cytokines. Authors suggest the significant reduction in pro-inflammatory cytokines may be beneficial to the disease course. Castellano et al. 2008  Acute aerobic exercise (single bout) versus chronic aerobic exercise (8 weeks) Acute exercise: MS patients and controls showed significant decreases in TNF-alpha directly after single bout of exercise. Chronic exercise: For MS patients, TNF-alpha levels increased after 8 weeks compared to controls Acute exercise: MS patients and controls showed non-significant trend toward decreased INF-gamma levels with single bout of exercise. Chronic exercise: In MS patients, IFN-gamma increased more significantly than controls after 8 weeks. The results suggest that patients with MS respond similarly to controls to a single bout of exercise stress. However, chronic exercise tended to increase pro-inflammatory cytokines which could have a deleterious affect on the disease. IL-6 is a key cytokine in the acute immune response and it is produced by a variety of cells. The reason it is not included in the chart is because it can act as a pro-inflammatory and an anti-inflammatory cytokine depending on the type of cell it is released from. While it was previously believed to be a pro-inflammatory cytokine, recent studies have found that it may induce an anti-inflammatory cascade, especially when related to exercise stress. While this would seem to be beneficial for the MS disease process, previous studies have also found that increased IL-6 concentrations may actually lead to increased inflammation. When produced and secreted by skeletal muscle, IL-6 is termed a myokine. Initially, it was thought that myokine release from muscles was the result of a pro-inflammatory response to muscle tissue damage. However, it has been demonstrated that simple muscle contraction without damage can cause myokine release. IL-6 does not act alone when released from the muscle and has influences on IL-1, IL-10 and TNF-alpha. However, the exact mechanism of such cascades is still unclear. Two of the previously mentioned studies, White et al. and Castellano et al., also measured IL-6 concentrations. Castellano et al. defined IL-6 as a pro-inflammatory marker and found a non-significant trend towards a decrease in resting IL-6 concentration in response to chronic aerobic exercise. White et al., defined IL-6 as an anti-inflammatory myokine marker and reported that IL-6 concentrations remained unchanged after 8 weeks of resistance training. These results both seem to be inconsistent with the idea that IL-6 should increase in response to muscle stress. Similar to the results of other cytokine responses to exercise, the results of these studies in regards to IL-6 are variable and inconsistent. The response of IL-6 to exercise is complex and further research is necessary to understand its role. However, it is postulated that transient increases in IL-6 and other myokines in response to physical stress may indeed be responsible for some of the beneficial anti-inflammatory effects of exercise. But chronic increases of these myokines may lead to the more detrimental pro-inflammatory responses. First, it should be noted that all of the above studies discussed also measured disability, quality of life and/or fatigue ratings pre and post intervention. Every study found significant improvements in these types of measures with exercise training. Therefore, though the results of the effects on cytokines are unclear, there is evidence to suggest that exercise improves the way the patient feels. The cytokine response is very complex and appears to be dependent on exercise type and intensity. Currently, there are no consistent results to determine the effects of exercise on cytokine response in MS. Furthermore, though exercise does appear to have an influence on cytokine concentrations, the correlation to potentially modifying the disease course of MS is still hypothetical. There is a complex relationship between the endocrine system and the immune system in relation to stress hormones. It is thought that stress hormones may be able to influence the immune response by stimulating a shift towards a Th2 phenotype. This theory is based on the reduction of development of EAE found in stressed animal models. Also, stress hormones can be involved in the production of cytokines. The two major stress hormones that are involved in cytokine regulation are catecholamines and glucocorticoids, which are both released during exercise. High levels of HPA axis activation are negatively correlated with presence of MS lesions, while low activity has been correlated with increased blood brain barrier breakdown. The HPA axis plays an important role in the induction of corticosteroids and catecholamines. Exercise is a significant stimulus for HPA activation and therefore may lead to increases in the circulation of catecholamines and glucocorticoids. The most common catecholamines are norepinephrine and epinephrine. These catecholamines stimulate a shift towards Th2 response because they inhibit production of IL-12, a major pro-inflammatory cytokine, and they induce the production of IL-10, an anti-inflammatory cytokine. Furthermore, they can lead to the activation of beta-adrenoreceptor agonists, which inhibit Th1 cell development and stimulate Th2 cell differentiation. Exercise activates the HPA axis, which leads to the secretion of catecholamines, specifically an increase in norepinephrine and epinhephrine. Theoretically, the stimulus of exercise could act as a modulator of cytokine activity that could have an effect on the MS disease course. However, current research is limited in this area. One study, by Schulz et al. found that changes in catecholamines from aerobic exercise were the same in patients with MS as in controls. The study by Heesen et al. found similar results; they found significant increases in norepinehprine and epinephrine in both healthy subjects and patients with MS, but no significant differences between the groups. Though there are not significant differences between the groups, theoretically, any increase in catecholamines may help modulate the inflammation process for patients with MS. Further research is needed, specifically on the activation of the HPA axis, to fully understand the role of catecholamines on MS disease status. In rat models of EAE, glucocorticoids have been found to play a major role in the disease course. Injections of glucocorticoids in rats have shown to be beneficial in preventing the initial attack symptoms, and an adrenalectomy is associated with more severe disease and even relapse of symptoms within days of removal. Similar to catecholamines, it is thought that these responses in rat models are due to the inhibition of pro-inflammatory cytokines (IL-12, TNF-aplha, and INF-gamma) with simultaneous stimulation of anti-inflammatory cytokines (IL-4 and IL-10) from the presence of glucocorticoids. Again, it is hypothesized that elevation of glucocorticoids due to exercise could potentially modulate MS disease activity, however, further research is needed to provide evidence. Many of the cellular processes involved in exercise and multiple sclerosis are well understood, however linking these cellular effects to formulate exercise recommendations requires some conjecture, as the associations are not completely clear. When making recommendations for exercise in patients with multiple sclerosis, clinical responses are important; however, here we attempt to justify these recommendations based on cellular processes. After reviewing the cellular biology, a combination of moderate aerobic (50-70% VO2 max) and resistance exercise (8-15 repetition maximum) for MS, 2-3 times a week, consistent with the charts above, is recommended. The cellular evidence is not strong enough to discount these guidelines or to make any other significant recommendations. The majority of studies investigating cellular effects of exercise used similar moderate intensity exercise protocols leading to the reported results. Moderate aerobic exercise has been shown to increase serum BDNF and NGF levels in humans, which play a role in preventing neural cell death and aide in neural regeneration. Also, in animal models, moderate aerobic exercise increased IGF-1 levels, which is beneficial for oligodendrocyte maturation and growth. Moderate exercise (resistance or a combination of aerobic and resistance) induces changes in stress hormones and cytokines involved in the inflammatory response, however the current results are inconsistent. The exact effect of exercise on inflammation for patients with MS is still unknown. Though the cellular inflammatory benefits are still unclear, in all studies reported, patients experienced improvements in disability and quality of life measures with moderate exercise. Intense exercise is not recommend due to the effect on heat shock proteins and ROS production. High intensity exercise in people with MS may cause detrimental effects to myelination due to the adverse effects of heat on neural conduction and heat shock protein expression. Heat shock proteins generally provide protection against stress, including stress induced by exercise, however in MS their interaction with pathologic cells such as cytotoxic T cells and APCs, may be harmful. In normal individuals, exercise increases mitochondrial function to maintain the energy demands required. In MS, mitochondria have been shown to have an increased baseline function to compensate for the loss of energy created by demyelination. The intensity of exercise becomes important when considering these cellular factors as a high intensity can lead to increased body temperatures and impaired neural conduction, provide opportunity for Hsps to activate pathologic cells, and further stress the already strained mitochondria. Moderate intensity exercise should create a balance that provides some of the cellular benefits presented without promoting the possible negative effects described here. 1. Dalgas U, Ingemann-Hansen T, Stenager E. Physical Exercise and MS – Recommendations. The International MS Journal. 2009; 16: 5–11. 2. Opara JA, Jaracz K, Brola W. Quality of life in multiple sclerosis. Journal of Medicine and Life. 2010; 3(4): 352‐358. 3. Krupp LB. Fatigue in Multiple Sclerosis: Definition, Pathophysiology and Treatment. CNS Drugs. 2003; 17(4): 225-234. 4. ACSM's Guidelines for Exercise Testing and Prescription: Eight Edition. Philadelphia, PA: Lippincott Williams & Wilkins; 2010. 5. Petajan JH, White AT. Recommendations for Physical Activity in Patients with Multiple Sclerosis. Sports Med. 1999; 27 (3): 179-191. 6. Stroud NM, Minahan CL. The impact of regular physical activity on fatigue, depression and quality of life in persons with multiple sclerosis. Health and Quality of Life Outcomes. 2009; 7: 68-78. 7. Dalgas U et al. Fatigue, mood and quality of life improve in MS patients after progressive resistance training. Multiple Sclerosis. 2010; 16(4): 480–490. 8. Prakash R, Snook E, Kramer A, et al. Cardiorespiratory fitness: A predictor of cortical plasticity in multiple sclerosis. Neuroimage. 2007;34(3):1238-1244. 9. Colcombe, S.J., Erickson, K.I., Scalf, P., Kim, J.,Wadhwa, R., McAuley, E., Kramer, A.F. Aerobic exercise training increases brain volume in aging humans: evidence from a randomized clinical trial. J.Gerentol. 2006; 61 (11). 10. White A, Lee J, Light A, Light K. Brain activation in multiple sclerosis: a BOLD fMRI study of the effects of fatiguing hand exercise. Multiple Sclerosis. 2009;15(5):580-586. 11. Wegner, C, Filippi, M, Korteweg, T, et al. Relating functional changes during hand movement to clinical parameters in patients with multiple sclerosis in a multi-centre fMRI study. Eur J Neurol. 2008; 15: 113–122. 12. Rocca, MA, Mezzapesa, DM, Falini, A, et al. Evidence for axonal pathology and adaptive cortical reorganization in patients at presentation with clinically isolated syndromes suggestive of multiple sclerosis. Neuroimage. 2003; 18: 847–855. 13. Liu, JZ, Shan,ZY, Zhang, LD, Sahgal,V,Brown,RV, Yue, GH. Human brain activation during sustained and intermittent submaximal fatigue muscle contractions: an fMRI study. J Neurophysiol. 2003; 90: 300–312. 14. Dalgas U, Stenager E, Ingemann-Hansen T. Multiple sclerosis and physical exercise: recommendations for the application of resistance-, endurance- and combined training. Multiple Sclerosis. 2008;14: 35-53. 15. Ng AV, Miller G, Gelinas D, Kent-Braun JA. Functional relationships of central and peripheral muscle alterations in multiple sclerosis. Muscle & Nerve. 2004;29: 843-852. 16. Harvey L, Smith AD, Jones R. The effect of weighted leg raises on quadriceps strength, EMG parameters, and functional activities in people with multiple sclerosis. Physiotherapy. 1999;85(3): 154-161. 17. Kent-Braun JA, Sharma K, Weiner MW, Miller RG. Effects of exercise on muscle activation and metabolism in multiple sclerosis. Muscle & Nerve. 1994;17(10): 1162-1169. 18. Kent-Braun JA, Sharma K, Miller RG, Weiner MW. Postexercise phosphocreatine resysnthesis is slowed in multiple sclerosis. Muscle & Nerve. 1994; 17(8): 835-841. 19. Davis SL, Wilson TE, White AT, Frohman EM. Thermoregulation in multiple sclerosis. J Appl Physiol. 2010; 109: 1531-1537. 20. Rossi S, Furlan R, De Chiara V, Mussella A, Lo Guidice T, Mataluni G, Cavasinni S, Cantarella C, Bernardi G, Muzio L, Martorana G, Centozone D. Exercise attenuates the clinical, synaptic and dendritic abnormalities of experimental autoimmune encephalomyelitis. Neurobiology of Disease. 2009; 36: 51-59. 21. Brown IR. Heat shock proteins and protection of the nervous system. Ann. N.Y. Acad. Sci. 2007; 1113: 147-158. 22. Cid C, Regidor I, Alcazar A. Anti heat shock protein 90 antibodies are detected in patients with multiple sclerosis during remission. Journal of Neuroimmunology. 2007; 184 (1-2): 223-226. 23. Yamada P, Amorim F, Moseley P, Schneider S. Heat shock protein 72 response to exercise in humans. Sports Med. 2008; 38 (9): 715-733. 24. Lundy-Ekman L. Introduction to neuroscience. Neuroscience: fundamentals for rehabilitation Third edition. St. Louis, MO. Saunders. 2002. 25. Bo H, Zhang Y, Ji LL. Redefining the role of mitochondria in exercise: a dynamic remodeling. Ann. N.Y. Acad. Sci. 2010; 1201: 121-128. 26. Campbell GR, Mahad DJ. Mitochondria as crucial players in demyelinated axons: lessons from neuropathology and experimental demyelination. Autoimmune Diseases. 2010; 2011: 1-9. 27. Mancuso M, Orsucci D, Coppedè F, Nesti C, Choub A, Siciliano G. Diagnostic approach to mitochondrial disorders: the need for a reliable biomarker. Current Molecular Medicine [serial online]. December 2009;9(9):1095-1107. Available from: MEDLINE with Full Text, Ipswich, MA. Accessed February 28, 2011. 28. Ding H, Jiang N, Zhang Y, et al. Response of mitochondrial fusion and fission protein gene expression to exercise in rat skeletal muscle. BBA - General Subjects [serial online]. March 2010;1800(3):250-256. Available from: Academic Search Alumni Edition, Ipswich, MA. Accessed March 2, 2011. 29. Gold SM, Schulz KH, Hartmann S, et al. Basal serum levels and reactivity of nerve growth factor and brain-derived neurotrophic factor to standardized acute exercise in multiple sclerosis and controls. J Neuroimmunol. 2003;138(1-2):99-105. 30. Sarchielli P, Greco L, Stipa A, Floridi A, Gallai V. Brain-derived neurotrophic factor in patients with multiple sclerosis. J Neuroimmunol. 2002;132(1-2):180-188. 31. Schulz KH, Gold SM, Witte J, et al. Impact of aerobic training on immune-endocrine parameters, neurotrophic factors, quality of life and coordinative function in multiple sclerosis. J Neurol Sci. 2004;225(1-2):11-18. 32. Goekint M, De Pauw K, Roelands B, et al. Strength training does not influence serum brain-derived neurotrophic factor. Eur J Appl Physiol. 2010;110(2):285-293. 33. Radak Z, Toldy A, Szabo Z, et al. The effects of training and detraining on memory, neurotrophins and oxidative stress markers in rat brain. Neurochem Int. 2006;49(4):387-392. 34. Berchtold NC, Chinn G, Chou M, Kesslak JP, Cotman CW. Exercise primes a molecular memory for brain-derived neurotrophic factor protein induction in the rat hippocampus. Neuroscience. 2005;133(3):853-861. 35. White LJ, Castellano V. Exercise and brain health-implications for multiple sclerosis: Part 1—neuronal growth factors. Sports Med. 2008;38(2):91-100. 36. Carro E, Nunez A, Busiguina S, Torres-Aleman I. Circulating insulin-like growth factor I mediates effects of exercise on the brain. J Neurosci. 2000;20(8):2926-2933. 37. Carro E, Trejo JL, Busiguina S, Torres-Aleman I. Circulating insulin-like growth factor I mediates the protective effects of physical exercise against brain insults of different etiology and anatomy. J Neurosci. 2001;21(15):5678-5684. 38. White, LJ, Castellano, V. Exercise and Brain Health- Implications for Multiple Sclerosis: Part II- Immune Factors and Stress Hormones. Sports Med. 2008; 38(3): 179-816. 39. White, LJ, Castellano, V, McCoy, SC. Cytokine responses to resistance training in people with multiple sclerosis. Journal of Sports Sciences. 2006; 24(8):911-914. 40. Golzari, Z, Shabkhiz, F, Soudi, S, Kordi, MR, Hashemi, SM. Combined exercise training reduces IFN-gamma and IL-17 levels in the plasma and the supernatant of peripheral blood mononuclear cells in women with multiple slcerosis. International Immunopharmacology. 2010; 10:1415-1419. 41. Heesen, C, Gold, SM, Hartmann, S, Mladek, M, Reer, R, Braumann, KM, Wiedemann, K, Schulz, KH. Endocrine and cytokine responses to standardized physical stress in multiple sclerosis. Brain, Behavior and Immunity. 2003; 17:473-481. 42. Ostrowski, K, Schjerling, P, Pedersen, BK. Physical activity and plasma interleukin-6 in humans – effect of intensity of exercise. Eur J Appl Physiol. 2000; 83:512-515. 43. Castellano, V, Patel, DI, White, LJ. Cytokine responses to acute and chronic exercise in multiple sclerosis. J Appl Physiol. 2008; 104:1697-1702. 44. Handschin, C, Spiegelman, BM. The role of exercise and PGC1 aplha in inflammation and chronic disease. Nature. 2008; 454(24): 463-469.